We give below the exchanges which appeared in the BCM in 1933 concerning the historical content of Lasker’s Manual of Chess, which had been published the previous year by W.H.Watts. The exchanges culminated in a response by Lasker. ‘On pages 179-192 of the new, English, edition of Lasker’s Chess Manual there is given a short historical sketch, or hint of a sketch, of the development of chess. 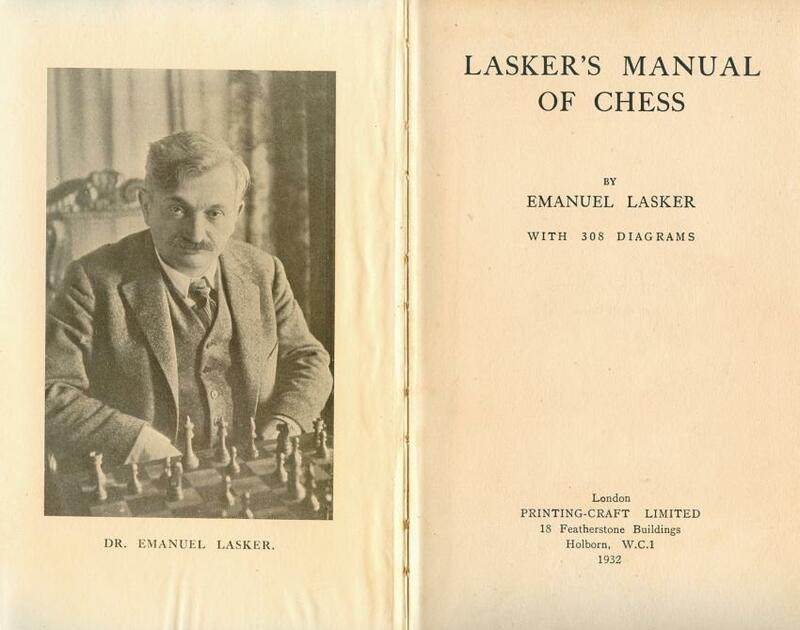 Now as Lasker’s Chess Manual is a most important book, theoretically and practically, and, in addition, most attractive to the eye with its matt dark cloth cover, its cheerful end-papers, firm print and pure white paper [But would it not have been improved if double columns had been reserved for games and analyses? Very short lines do not make for easy reading. And the printer has frequently been forced artificially to space unemphatic words in order to fill up the line.] it will certainly have, probably already has had, a very large sale. It seems, therefore, worth while to point out that Dr Lasker’s historical edifice is exceedingly shaky. Now the modern game of chess, with the extended move of the queen and bishop, did not exist until the end of the fifteenth century. And it is to the end of the fifteenth century that the game in question, between Castelvi and Viñoles, belongs. But it must be remembered that the chess authors of the Renaissance period who achieved print were two Iberians, the Spaniard Lucena, in 1497 (or a little earlier), and the Portuguese Damiano, in 1512 [With the possibility of an earlier edition, lost to us. ]; and that the first printed chess book of the period succeeding the Renaissance was also an Iberian’s, the Spaniard Ruy López, in 1561. It was not until 1597, 36 years later, that the first practical [Vida’s Latin poem, indeed, had been printed in 1525 (unauthorized edition) and 1527. It is this that Goldsmith translated, and not, as the London Mercury lately said, “a Sanscrit epic”.] book on the game by an Italian, that of Gianutio, appeared. The first great age of Italian chess does not fall within the period of the Italian Renaissance. It is later, 1560-1634, from Leonardo and Paolo Boi to Salvio and Greco: the period of the Counter-Reformation with its Index and Inquisition – a point of which both Catholic and Protestant controversialist might make something. Philidor had visited both Holland and England twice before the publication of the first edition of the Analyze in 1749, 40 years before the outbreak of the French Revolution in 1789. He visited England annually from 1775 onwards. What the French Revolution eventually did was to prevent him getting back to France. The importance of the Analyze did not lie in the analysis of openings, but in teaching a general method of play, a strategy, expounded in four games, composed games, complete to the winning positions, with back-games. These were accompanied by many notes explaining the object of certain moves, and why some were good and others bad. It was these notes that made the book so valuable to the ordinary player. They were singled out for praise by Ponziani in an otherwise severely critical notice in his first edition of 1769. “On its account”, wrote Twiss, “it is the best book of the kind, and almost the only one from which anything relative to the practical part of the game may be learnt”. Historian of what? Staunton was an Elizabethan scholar, a Shakespearean critic and annotator. It was Buckle, Staunton’s chessplaying contemporary, who was the historian. A quite excusable slip in the first edition of a German book. But why has it survived the other German editions, and the American edition, to reappear here? This was not the opinion of the editor of the book of the London Chess Congress of 1883, the tournament which saw Zukertort’s greatest triumph. He says (page xxv), “Zukertort enrols himself in the modern school of strategy versus combination”. And Zukertort’s openings in that tournament, Queen’s Pawn, 1 P-QB4, 1 Kt-KB3 and Ruy López, suggest the same thing. The late Amos Burn once said to me at the City of London C.C. that a study of Zukertort’s openings in the 1883 tournament would probably still teach the present-day player much about the closer forms of the Queen’s Gambit Declined, and about the Queen’s Pawn and kindred openings. Nor was Dr Lasker’s opinion the opinion of Steinitz himself, who in his obituary notice of Zukertort (International C.M., 1888, page 195) wrote: “He had no doubt an excellent position judgment”, and, in answer to Zukertort’s alleged claim to have amalgamated in his practice the principles of the old and of the modern school, gave it as his opinion that Zukertort’s chief failures were due to such an attempt, and that “he did not fully comprehend the spirit of the reform which has taken place in the conduct of the game”. Could Steinitz have written “fully comprehend” of a combination player, pure and simple? All that Steinitz wrote about Zukertort shows that he regarded him as too much of a routine player. All through his life Steinitz brought off magnificent combinations. Game after game in Devidé’s Memorial to Mr William Steinitz simply dazzles one by its coruscations. I have read, too, that Steinitz in his youth was called “the Austrian Morphy”, and that later in life he confessed that he did not in early days play so much to win as to sacrifice his queen. He never lost this early capacity. He disciplined it, and added to it his doctrines of “the modern school”. In spite of Alekhine’s achievements some people still think that Steinitz’s brilliancy prize game against von Bardeleben at Hastings towards the end of his career is the finest ever played. In reviewing these seven points it must be remembered that, as we are told in the Introduction, the work “is neither the translation of the original German book nor a reprint of the American edition” but “a thoroughly revised treatise containing the best of both books” and the result of “many long months of unremitting labour”. What, too, are we to make of the remark on page 228, “His (Steinitz’s) talent for over-the-board play was not considerable”? And how reconcile it with the statement on the dust-wrapper above Dr Lasker’s appreciation of Steinitz, “No doubt is left in the reader’s mind as to who Lasker thinks was the greatest player that ever lived”? Suppose we discount Steinitz’s victories over Blackburne and Zukertort, on the grounds given that he was a profound thinker and that they were not. (And yet we must remember the disparity in the scores, 7-1 in the first match against Zukertort, 7-0 against Blackburne.) Suppose we forget altogether the two victories over Chigorin and the match against Gunsberg. Still we cannot forget that Steinitz, in his gambit days [He offered the King’s Gambit five times (four Salvios, one Gambit Declined). In the other two games, Anderssen defended with the Sicilian.] only four years after the London Tournament of 1862, defeated Anderssen by 8-6. It would be interesting if Dr Lasker’s informant, or informants, would tell us more about this. I have always understood that Potter was Steinitz’s pupil, at any rate in the sense that he of all the amateurs in London entered most fully into Steinitz’s views, and was most affected by them. I have certainly read that he alone of the playing committee could understand Steinitz’s plan of campaign in the great correspondence match London v Vienna, 1872-74, and that the other members gradually ceased to attend, leaving Steinitz and Potter to conduct London to victory. There may, however, be something of legend in this. Not many men could find the time for analysis of two such games, one (the Scotch, defended by London with 4...Q-R5) of the most laborious kind. There is a still greater desideratum. Could not the editor of the BCM induce the greatest student of Steinitz in this country to give us his judgment on the views stated by Dr Lasker on pages 188-190 and 196-199. Does Mr Atkins think that all this was “subconscious with Steinitz” and “the outcome of Steinitz’s psychology”? Footnotes by Goulding Brown have been given above in square brackets. ‘Nothing that has appeared in the BCM for years past has delighted me so much as the contribution in your February issue by Mr Goulding Brown on Dr Lasker’s Manual of Chess. It has long been a grievance of mine that so far as chess books are concerned the art of reviewing has almost entirely disappeared. It seems that Editors imagine book publishers send copies of their new publications solely to get the little bit of publicity which a favourable puff will provide, and are averse to any form of criticism. Either this, or books are reviewed by writers not sufficiently qualified to criticize, or who do not know what a book review is. I remember in my early days book reviewing was taken quite seriously, and choosing reviewers for important books was a task requiring the most careful consideration. Editors took great care to see that books had adequate and suitable attention, and in no case would the trite clichés which now pass as reviews be accepted. “Well printed”, “On good paper”, “Many and very clear diagrams”, “Profound analysis”, “A splendid selection of brilliant games”, with a few other stock phrases similarly pleasant, culminating in “No chessplayer’s library is complete without it” exhaust almost every review of a chess book that has appeared for many years. How different it was in the past. Comparatively speaking Chess Blossoms by Miss F.F. Beechey is a very unimportant book, and yet in the Chess Player’s Chronicle of 1883 no less than four pages were devoted to its review. This review is a critical examination of the contents, and is what I with my old-fashioned ideas always imagined a review had to be. The review of Horwitz and Kling’s End Games occupies two pages of the CPC for May 1884, and I could multiply these instances many times by reference to early issues of the BCM itself. It must happen occasionally that the most important chess event of the month is the publication of some new book on the game, and yet it gets but scant notice, on the lines indicated, and henceforward passes into oblivion. To return to Mr Goulding Brown’s contribution. Is is not remarkable that we have had nearly one hundred press reviews of Dr Lasker’s Manual, including one in the BCM, and in no case has the reviewer called attention to a single one of the points so justly raised by Mr Brown? I recognize his contribution as a delightful leg-pull. No doubt he is right in all his seven points, but of what importance are they? What does it matter whether our earliest specimen game is from the fourteenth or fifteenth century, or whether the French Revolution drove Philidor to this country or merely prevented his return to France? Of the remaining five points, two more are of little actual moment and are easily corrected, now at last attention has been called to them. Dr Lasker, if I may dare to say so, has his weaknesses just like an ordinary mortal, and whilst he will allow a publisher to correct (perhaps simplify is a better term) his English, he will not permit even discussion upon his “philosophy”, a subject far beyond any mere publisher. Therefore I am amused, and more than a little pleased, that some passages “stump” one of Mr Goulding Brown’s standing, to use his own expression. The reference to Staunton is a slip of course, but as to Steinitz, Zukertort and Potter, I must confess that all through I had the impression that Dr Lasker had tried to fit the facts to his own particular theories, just as our lawyers manipulate circumstantial evidence. It is even probable that he is right, although perhaps not in the full literal sense. He allows that Steinitz deliberately changed his style – possibly when he found that others were equally capable of evolving deep and brilliant combinations. Steinitz’s new-found theories enabled him to go one better, and so he forced his opponents to beat themselves in their desperate efforts to find winning combinations. However, it was not my intention in writing this letter to enter into a discussion either of the questions of fact or of Dr Lasker’s philosophy, but merely to express my satisfaction at the revival of book reviewing, although in this instance it happens to be purely incidental. All the same I hope I may be allowed space enough to refer to Mr Goulding Brown’s two quotations, one from my Introduction and the other from the wrapper, which, after all, in conjunction with his point (7) is his most serious criticism. I have acknowledged the slip in referring to Staunton as a “historian”, although perhaps this is little more than a slipshod use of the word, rather than an error, the result of ignorance. “The long months of unremitting labour” were almost exclusively spent in correcting the actual chess, which in the American Edition was shockingly presented. Only those who were the unfortunate purchasers can imagine how many and how varied were the mistakes. I had no idea that there could be so many different kinds of blunder, and it frequently happened that a whole evening was spent in elucidating a single position or variation. It may be difficult at a cursory glance to justify Dr Lasker’s statement that Steinitz had no great talent for over-the-board play with what I say on the book wrapper, but his every other reference to Steinitz is full of praise and admiration. Shall we therefore allow Dr Lasker just this one inconsistency. It is not so serious as it sounds if we insert the word “natural” before “talent” and persuade ourselves that the circumstances forced Steinitz to acquire a degree of skill at over-the-board play that was not inborn – a fact that was possible because he was a profound thinker. I thank Mr Goulding Brown most warmly for his criticisms. So far as is in my power, due effect shall be given to them in any new edition. I have enjoyed his contribution, particularly his final paragraph. I am no student of philosophy, and I am glad to find that I have floundered in such good company. The language of pucca philosophers is even worse than Greek to me, with which I had a minimum of acquaintance in my school days. When reading proofs of the Manual I did not dare to raise queries, feeling that it was all above my head, and that it would only make my ignorance appear even more abysmal than it is. Finally, Dr Lasker’s object was to write a book that would point the way to a mastery of chess, and whatever its minor faults, and whatever our opinion of his philosophy may be, it has to be admitted that this is the most important book on chess since Steinitz’s Modern Chess Instructor – and according to some experts the most important book on chess that has ever been written. Apelles, a celebrated painter in Ancient Greek days, had just completed a large picture, showing several human figures, when a cobbler came along and pointed out to him that the shoes (or sandals) were drawn incorrectly, whereupon Apelles, with a few strokes of the brush, corrected his mistake. Now what has this story to do with chess? A great deal. There are plenty of cobblers about now, even at chess. For instance, in the February number of the BCM a distinguished gentleman finds fault with Dr Emanuel Lasker’s Chess Manual. First of all he claims that the historical retrospect is inaccurate in a few unimportant instances (which might easily be rectified in a subsequent edition) and, secondly, he finds fault with Dr Lasker’s “philosophy”, perhaps rightly, perhaps not, and perhaps nothing more than a matter of opinion. Do these minor blemishes in [any] way detract from the real merit of the book? Hardly. The essential parts of the book give a masterly exposition of the progress of chess as exemplified by the efforts of Steinitz, Lasker and the most prominent of their predecessors and contemporaries, and are full of valuable instruction. ‘As a mere “man in the street” – a Snagsby of the chess world – I was intensely interested in Mr Goulding Brown’s amiable bombardment of Dr Lasker’s “historical edifice”, and in Mr Watts’s no less delightful reply. May I, however, with a submissive cough, dispute (1) Mr Watts’s verdict that in a classic treatise on chess theory and practice a mere historical error is of no importance, and (2) Mr Müller’s somewhat pungent rider to the effect that any person who goes to the length of pointing out such an error is, “not to put too fine a point upon it”, simply wasting his own time and everyone else’s? ‘On page 250 of your magazine Mr Wilmot criticizes the omission in Dr Lasker’s Chess Manual of the fact that the first book printed in the English language was a chess book. The history of Early English printing is in my opinion not completely explained. The first book of Caxton’s appears to have been the Recuyell of the historyes of Troye (c. 1475), the first dated Dictes & sayenges. Between there is indeed The Game of Chess, which was already translated in 147 [sic] (cf. Kolophon) but was only printed in 1475-76. If one makes the objection against Lasker of omissions and superficialities in a book mainly devoted to practical play, one should, before raising the objections, become better acquainted with the facts. Caxton translated the book widely circulated in the Middle Ages, the Traktat of Jac. de Cessolis. López’s Libro de la invención liberal y arte del juego del Axedrez appeared in Alcala in 1561. López was not yet born in 1475, quite apart from the fact that Cessolis wrote his Liber de moribus hominum et officiis nobilium about 1275. ‘During my recent visit to England I have perused the correspondence in the BCM on various points in my Chess Manual, and with your permission I venture to supplement the well-reasoned reply made by Mr W.H. Watts. It was not my intention to write on chess history, but to give in simple language an account of the evolution of chess practice and chess thought. As regards the various points raised by Mr Goulding Brown, I will deal with them in order. Point 1. I saw the game in question 25 years ago; it plainly shows how tyros make plans, and from that point of view is interesting. In view of the data ascribing the game to as late a period as the end of the fifteenth century, I stand corrected. Point 2. I take it that the plan generally followed by Italian Masters arose before the period in which Italian Masters wrote books. Point 3. Philidor was probably glad, in the critical period of the Revolution, to find a place of refuge in Holland or England. Point 4. The Manual is hardly in contradiction to the point raised by Mr Goulding Brown. Point 5. Did not Staunton need the knowledge and the method of the historian for his studies of the Elizabethan period? It is this I had in mind when using the term “historian”. Besides, Staunton had the historian’s outlook on life, which differs widely from that of other types, say the mathematician’s (Anderssen) or musician’s (Philidor). Point 6. I regret, but I uphold my conception of Zukertort’s style of play. Point 7. All great Masters can conceive great and brilliant combinations, but not all of them are creative in that line. Steinitz’s superiority was based on his philosophy of chess. Now as to my philosophy. Mr Goulding Brown disarms me by claiming for himself no authority whatever in that domain. In speaking of the reason of a plan I did have an end in view. Many chessplayers have peculiar notions as to how a chess master does his thinking, and it is not easy to make them understand. Language is pregnant with old philosophical thought, and a new idea, in making use, as it must, of old terms, has to rely on the reader’s imagination and good will. The motive for a plan, the reason of a plan, the raison d’être of a plan, all these arise from valuation. I wanted to suggest this idea. If the reader grasps it he will more readily understand that a new style of planning must be generated at a period when valuations have undergone a change, and that it cannot arise nor be logically founded in any other way. Schopenhauer in his Dissertation, considered an authoritative book on the “fourfold root” (cause, motive, logical reason, raison d’être and related concepts), unfortunately maintains and believes he demonstrates the deterministic doctrine, and I wanted to prepare my reader, be it ever so little, for the important doctrine of the creative power of the mind, also called freedom of will. For all my good intentions, Mr Goulding Brown’s deep misgiving as to my diction or the validity of my thought may be justified. In this contingency I claim the tolerance expressed by errare humanum est, but I hardly think that what I said is too simple or abracadabra, and therefore for this and other reasons I should be delighted if Mr Goulding Brown’s suggestion that a competent authority give his views on my philosophy should be acted upon. See also Steinitz, Lasker, Potter and ‘Modern Chess’.